Today’s home extends beyond interior rooms, bringing fashion, form and function to outdoor living spaces. Dressing up patios, garden spaces, terraces, balconies, poolside gathering spots and backyard relaxation areas with durable, weather resistant accessories is the hottest decorating trend among homeowners across the country. Gone are the days where you are limited to just entertaining inside your home. With our stunning assortment of affordable indoor/outdoor area rugs and carpets, your al fresco space will turn into your go-to spot for entertaining and define a cozy area where family and friends gather. As an innovator in the outdoor living category, our product assortments combine fresh styling with unique fiber contents and construction technology. 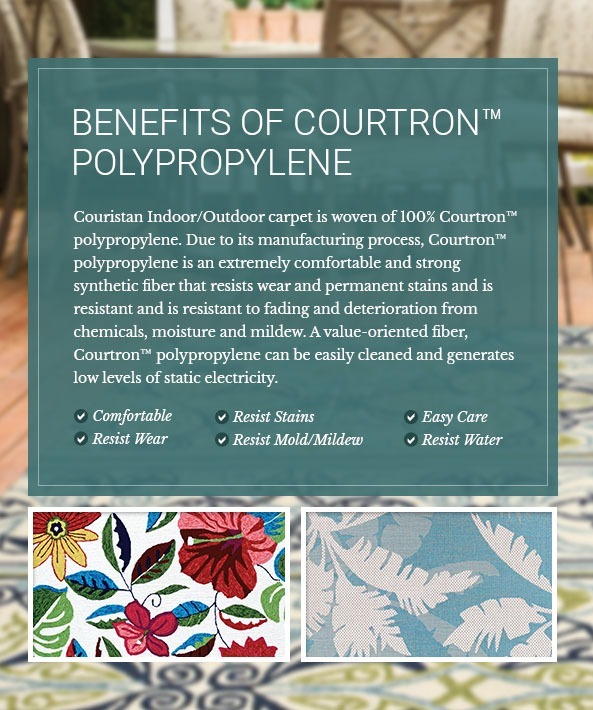 Each of our indoor/outdoor area rugs and carpets are made with the finest 100% Courtron™ polypropylene and are mold and mildew resistant, as well as ultraviolet (UV) stabilized for longer color retention. 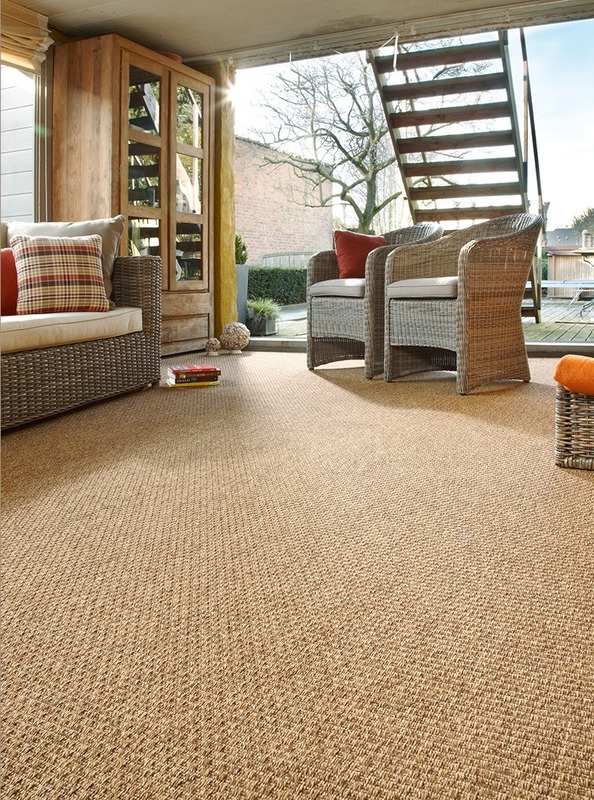 Unlike traditional indoor floor covering products that contain jute in their backing, our indoor/outdoor performance products have a 100% Courtron™ polypropylene backing which makes them completely water resistant and perfect for your outdoor areas. 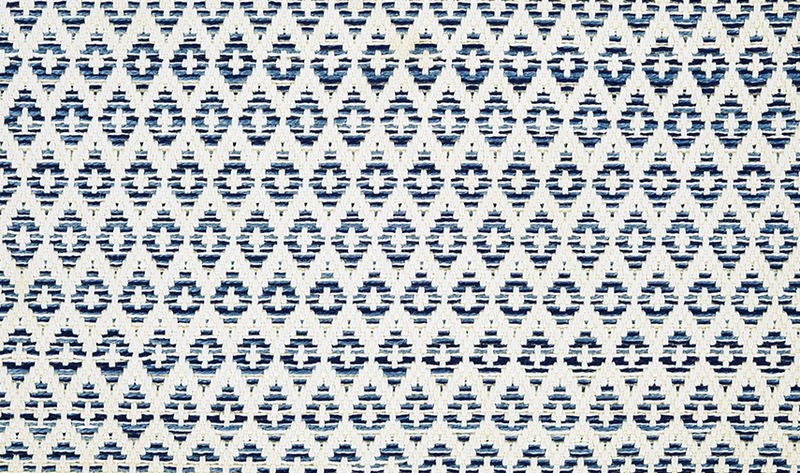 Attractive enough to be used inside, yet sturdy enough to withstand the elements of the great outdoors, our indoor/outdoor area rugs and carpets feature limitless versatility and casual-chic appeal. From the front door to the backyard, these charming floor fashions are an effortless way to add warmth and a welcoming aesthetic to the outdoor areas of your home. Carefully measure the outdoor space in which you would like to place your area rug before purchasing. Be mindful of all outdoor obstructions including but not limited to pillars, fireplaces and cooking areas. Always consider special shapes such as rounds, squares and octagons when it comes to surrounding your outdoor furniture. 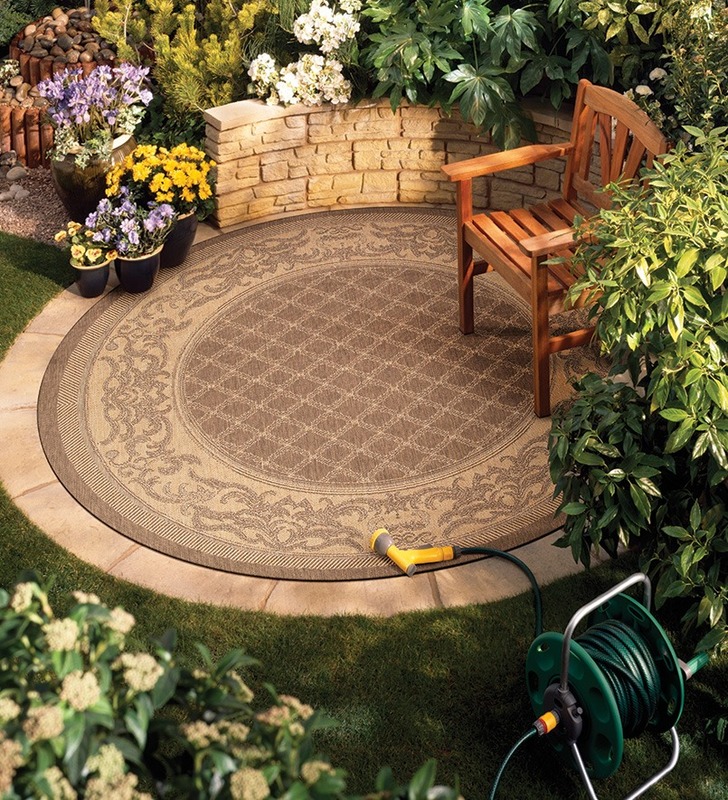 As an example, a round patio or decking table may look appropriate with a round shaped area rug below it. As with indoor area rugs, generally, your area rug should be at least 2 feet wider than the table on all sides. When considering using an outdoor hand-hooked area rug which features a thicker surface pile, leave enough space so that the area rug extends beyond the back legs of a chair when your guests are seated. This is critical as your chairs may wobble on an uneven surface. When letting your indoor/outdoor area rug define your setting of choice, it’s important to go bigger with your size selection. This will provide your space with a designer look and feel that will make a greater impact. Accessories and furniture pieces should be less decorative in these cases. Vacuum or sweep your area rug regularly. This will prevent dirt from getting deep into your area rug’s fibers. It is also advised to sweep under your area rug in order to prevent damage from mildew or mold. In the event of spills on your area rug, blot the affected area (do not rub), with a soft absorbent cloth. To remove dirt spots, use a solution of mild soap or water. Hosing your area rug is a cleaning option. To hose the whole area down, spray the area rug or use a garden hose and allow it to dry under the sun. Turn the area rug over to make it possible for the other side to dry, if required. Be sure the entire area rug is dry before placing it back down (especially inside the home), as mold or mildew can form in wet areas. 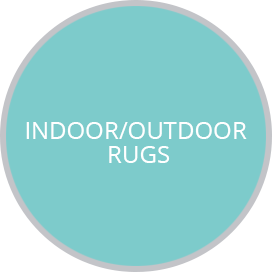 While your indoor/outdoor area rug is suitable for outdoor use, it is strongly recommended that you store your area rug indoors during severe or prolonged weather conditions. If you have purchased a hand-hooked indoor/outdoor area rug, special care should be taken when vacuuming with a vacuum that has a beater bar. The beater bar could catch or pull the loops in the area rug’s pile, causing severe damage. If loops or tufts appear above pile of the area rug, do not pull them. This is not a defect, it is a common condition called “sprouting”. Use a pair of scissors to cut the loop or tuft and trim the ends even with the area rug’s pile. 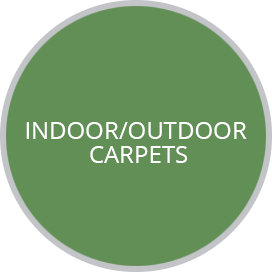 If you haven’t thought about indoor/outdoor carpet as a viable option for your home, think again? With advancements in fiber usage, construction, color, style and texture, today’s indoor/outdoor carpets go well beyond the original green, tough turf feel and appearance. Durable enough for the outdoors, yet attractive enough for your indoor décor, indoor/outdoor carpets can provide an easy transition from an interior space to an exterior one. Perfect for high-traffic, semi-outdoor areas such as screened porches or patios, indoor/outdoor carpets are a relatively inexpensive solution for protecting bare feet from splinters, glass from shattering and softening unfriendly wood or concrete surfaces. 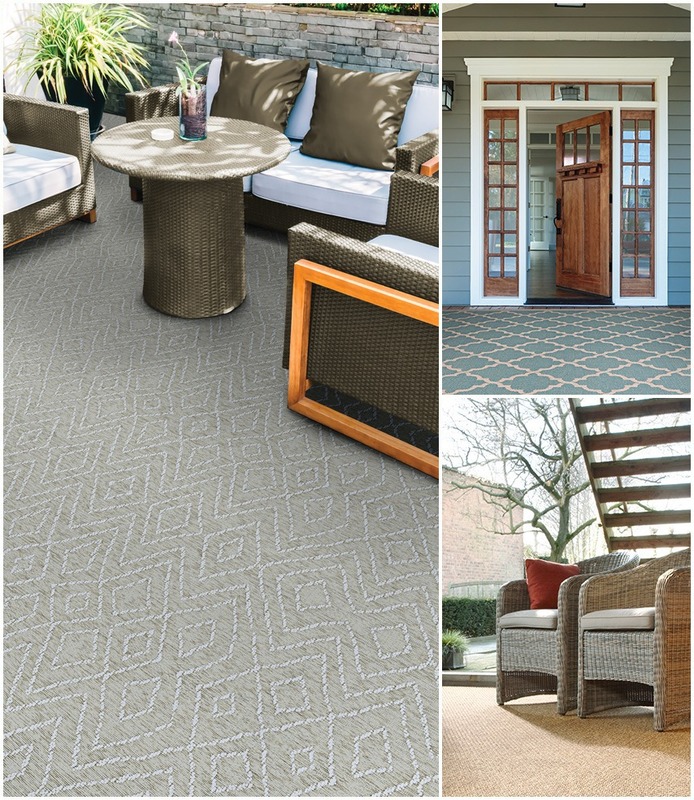 In addition to porches and patios, indoor/outdoor carpets are a practical option for basements due to the fact that most indoor/outdoor carpets in today’s market are woven of polypropylene, a synthetic fiber that is water, mold and mildew resistant. Our assortment of indoor/outdoor carpets feature a durable, structured flatwoven surface that is UV stabilized for strong color retention. The use of our exclusive Courtron™ polypropylene fiber, allows our carpets to easily be cleaned and maintained, while providing a soft textured surface. Stocked in a 13’2” width for ease of installation, our indoor/outdoor carpets can be fabricated into a custom size area rug using our selection of 100% Courtron™ polypropylene, UV stabilized binding tapes or synthetic serging. Preferably use a vacuum cleaner with rotating brushes. They are more expensive, but are more efficient at removing dust and dirt. The frequency depends on the use and the degree of dirt in the carpet. Rooms or outdoor spaces with higher usage should be vacuumed more frequently. Please read the instructions carefully and always remove the stains as quickly as possible. Stains should always be removed immediately. Remove the solid particles with a spoon. Then wipe off the stain with a dry absorbing cloth. Define the type of stain to choose the appropriate product in the table below. Apply the right amount of product, not too much, not too little. Make sure to rinse the carpet to remove the cleaner and the dirt. Wait until the spot is completely dry before walking over it again. Stains in the carpet can even be cleaned using bleach (1 part bleach/10 parts water). Water: Wipe the stain with a clean white cloth or paper towel. Then treat the stain with a damp cloth and rub until no more dirt shows on the cloth or paper towel. Soap (1 tablespoon of soap powder in .25 liters of water): Wipe off the stain with a clean cloth or paper towel. Treat the stain with the cloth soaked in soapy water and rub until no more dirt shows on the cloth or paper towel. Important: Rinse the spot again with clear water and remove the soapy residue with a cloth or paper towel. Dilutents: Wipe off the stain with a cloth soaked in dilutents until all dirt is removed from the carpet. Important: Never pour a cleaning agent directly on the stain! Stain Remover: Wipe off the stain with a cloth soaked in benzene until all dirt is removed from the carpet. Important: Never pour a cleaning agent directly on the stain! Acetone: Wipe off the stain with a cloth soaked in acetone until all dirt is removed from the carpet. Important: Never pour a cleaning agent directly on the stain! Extraction cleaning is the best way to clean textile floor coverings. You can do this yourself by renting or purchasing a specialized extraction cleaning machine, however it is preferable to leave it to a professional who will be familiar with the treatment requested for your type of carpet. Extraction cleaning uses pure water with added cleaning agents. Dirt is removed as the water is vacuumed out of the carpet. We recommend that your carpet be rinsed after to ensure removal of any remaining cleaning agents. This method uses dried powder soaked in cleaner. It is sprinkled on the carpet and worked into the carpet. The surface dirt is absorbed by the cleaner. After evaporation, the powder saturated with dirt is vacuumed. The advantage of this method is that there is no need for drying time. In principle, it is possible to walk on the carpet during cleaning. This method achieves an effective but careful shampooing through the combination of a special shampoo with soft brushing mechanism and the added air oxygen in the cleaning agent. This creates a relatively dry micro-crystal foam which penetrates deep into the dirt and gives excellent cleaning results. The shampoo cleans deeply without water and dries to a fine powder with the dissolved dirt, which is simply vacuumed after drying without sticky residues.